Hey kids, let’s put on a show (musical)! Not all that colorful, but at least consistent. 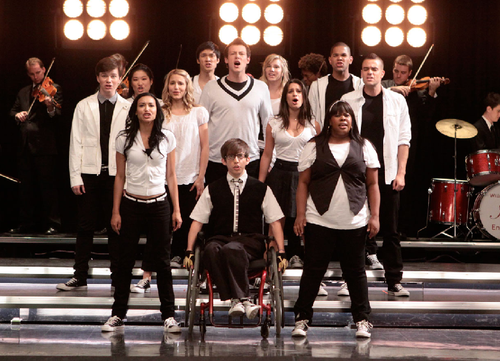 Artie initially “dancing by himself” and then “proudly” with New Directions. 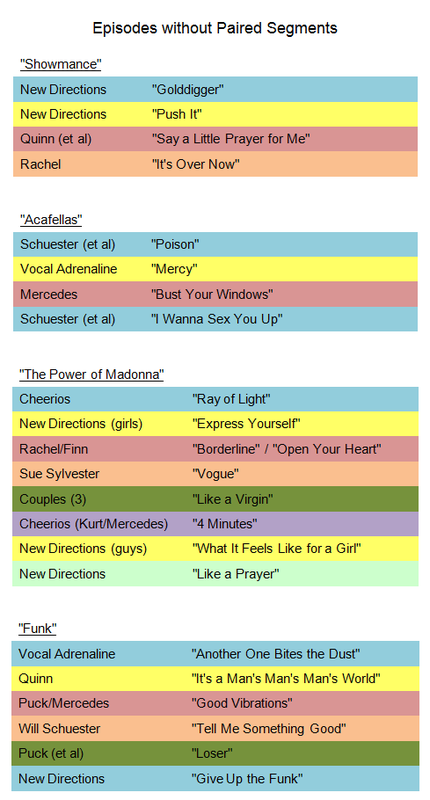 What’s more, the musical numbers in these three episodes are limited (unlike those in “The Power of Madonna,” for instance) and spread evenly throughout. For example, like its show-musical predecessors Singin’ in the Rain (Stanley Donen and Gene Kelly, 1952) and The Band Wagon (Vincente Minnelli, 1953), Glee‘s “Pilot” features a song about every 10 minutes; moreover, “Wheels” positions its songs in a nearly perfect arc: one at the beginning, middle, and end. Finally, each of the numbers in these episodes serves a convincing purpose. For instance, in “Pilot,” Rachel (Lea Michele) auditions for glee club with “On My Own,” effectively informing the viewer she is both passionate about Broadway musicals and isolated in high school. Echoing this number, Finn (Cory Monteith) sings REO Speedwagon’s “I Can’t Fight This Feeling,” conveying to us that although glee club isn’t traditionally for football players, he won’t be able to “fight the feeling” to join. In interviews, Murphy claims that with Glee he is creating a “postmodern musical” in the vein of Chicago (Rob Marshall, 2002) or Moulin Rouge (Baz Luhrmann, 2001). But what he ostensibly fails to realize is that these two films — while perhaps modern in look, themes, and style (editing in particular) — still conform to the structure of classical musicals, operating almost exclusively through doubling or paired segments.9 Furthermore, Murphy admits that he bases Glee‘s musical numbers on “stuff that I like and that I think fits the characters and moves the story along.” On its surface this is perhaps fine, but since musical narratives — like all genres, television shows included — necessitate structure, that “stuff that Murphy likes” needs to be framed more consistently within matched scenes and sequences. Perhaps then Glee wouldn’t feel so uneven. 1. Hey kids, let’s put on a show (musical)! 3. 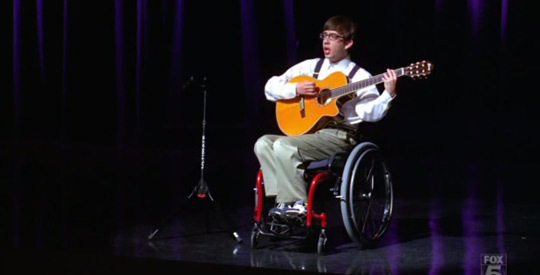 Artie initially “dancing by himself” and then “proudly” with New Directions. Great piece Kelli! 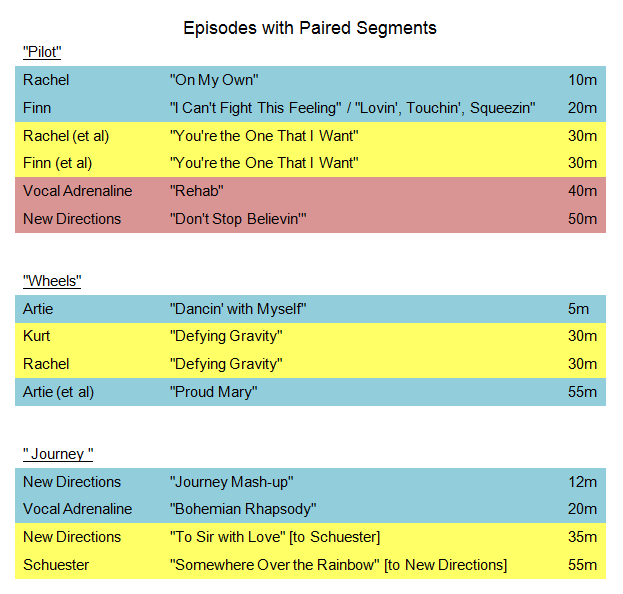 I never thought about the show’s lack of “paired segments” but looking at your colorful charts, you are right–some of the least satisfying episodes are those with erratic song choices. I too am often left feeling unsatisfied at the end of a GLEE episode (despite the fact that I really enjoy the musical numbers individually). Rather than using musical performances to move the narrative forward or create an emotional break through, songs seem to be chosen based on how well they will chart on I-Tunes the next day. This is a shame because the show could really be doing some great work in terms of upating the musical form for television. Lots to think about here–thanks! Very insightful piece! As you point out, there is plenty of recent Glee criticism and commentary, and I appreciate your ability to thoughtfully consider the generic elements present (or not present!) that help/hinder the show’s evenness. Your observation that the show musical is the most lucrative option for Murphy, but that it isn’t necessarily executed in the smartest way, is specific and convincing. Thanks for this interesting piece, Kelly. I really appreciate your illustration and discussion of how Glee’s pilot, “Wheels,” and “Journey” are particularly balanced in relation to their storylines, character development, and tone as witnessed in the musical numbers, and I agree that as a result they can provide a particular sense of “completeness”” to many viewers. I wonder, however, at whether such episodes don’t also feel particularly predictable and nostalgic for earlier eras, when we were more likely to expect this kind of tonal balance in a film or television episode, musical or otherwise? While as a fan I certainly have enjoyed the “balanced” episodes mentioned in relation to that balance, I would not have stayed with the show if it didn’t often surprise as well and not meet previously established expectations at times in relation to the musical numbers and various storylines. Do you feel that Glee would be more successful if its episodes always aimed for the musical balance achieved, say, in “Wheels”? Thank you for such a thought-provoking article! It certainly made me think about Glee from a really different perspective that I hadn’t considered before. I wonder, though, if we should expect Glee to adhere to the structure of the traditional musical–Glee is not a musical, after all. I’d say it’s a transgeneric show that draws on the elements of teen drama, comedy, and the musical, but mixes them in unexpected ways. Considering the genre mixing happening in Glee, I find it unsurprising that the show has moved beyond the conventions of the traditional musical. Hi, Mary — thanks for reading and commenting! Honestly, I do think Glee would be more successful critically if its episodes aimed more consistently for the musical balance in “Wheels” or “Pilot” or “Dream On.” Murphy et al could still surprise audiences week to week via spectacle, storyline, characterization, etc. just as his musical inspirations (Moulin Rouge and Chicago) surprised their audiences. However, without some sort of narrative structure, Glee just comes across as a total mess, does it not?